Thoughtful conversations that give people getting out of prison a better chance for a different future. 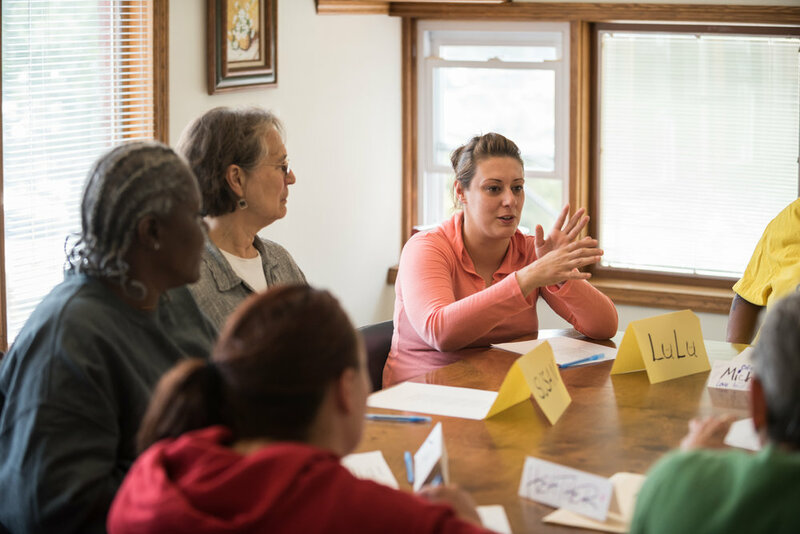 Reading Between the Lines® uses discussion of literature to build critical thinking and communication skills with formerly and currently incarcerated women and men. This intellectual exchange nurtures self-confidence and collaboration, offering participants a chance for a different future. Education levels of those leaving prison average between the 8th and 12th grades. Reading Between the Lines is a simple but powerful way to build critical thinking and effective communication skills. The idea is to “unpack” a short, powerful piece of writing—poem, essay, speech—in small discussion groups led by trained facilitators. The group reads the text aloud and listens to each other as they understand and analyze what the author is trying to say. The conversations are lively and respectful. There are no tests or grades. There are no right or wrong answers as long as responses can be supported by evidence from the text. The sessions are thoughtful conversations through which women and men learn to listen, think, express opinions and exchange ideas. In the process, they build confidence and self-worth. With even modest, newly acquired soft skills, like careful listening, critical thinking and effective communication, participants re-entering the community have a better chance for a different future. Beginning as a pilot program at St. Leonard’s Ministries on Chicago’s west side in September 2013, Reading Between the Lines currently works at three transitional residential facilities for the re-entry population in Chicago, where trained volunteers facilitate discussions of short literary masterworks. Since its inception, the program has engaged 20 volunteer trainers and served 450 participants. Discussions are held weekly, 50 weeks of the year.